Cake for breakfast! Who doesn’t love that? Me, oddly! I think it’s weird. I have never been a fan of super sweet things whenever I have breakfast made for me – it’s almost always pancakes. So I needed a bit of a compromise here as I love my eggs and bacon and he seems to love his cake. You may wonder, how the heck is this less sweet than a normal pancake!? There’s sugar in more elements than just the typical maple syrup! 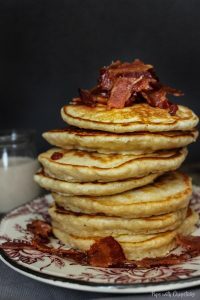 You’re right this isn’t less sweet than an average pancake breakfast but this recipes allows me to sit there and munch on bacon all morning while Terry eats the lemon pancakes. This is a very versatile lemon pancake recipe, in fact you can probably replace the lemon zest for grated ginger, banana, chocolate chips etc. Go nuts and be creative. For this lemon pancake recipe, all ingredients can be found at your local grocery store. I decided to use condensed milk as the sweetener for the actual pancakes since we were already opening a can to make the syrup. It turns out that was a good experiment. The condensed milk gave the pancake an extra creaminess that plain sugar would not provide. 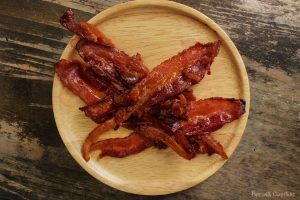 This one is quite simple to make, you just have to remember one thing – You need to put the bacon in the oven before it is pre-heated. I know weird right? I can’t tell you how many times by habit that I wait until the oven reaches up to temp. By having a pre-heated oven, I found the bacon doesn’t get nice and crispy since we are working with very high heat and it will just instantly cook in that temperature and then burn. 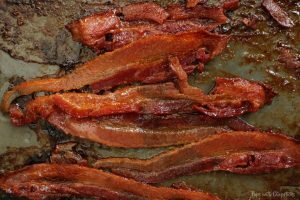 Lay out parchment paper over a cookie sheet and layout the bacon 1 at a time side by side. Set the Oven to 400F (204C) and put the tray of bacon into the oven right away! Don’t wait for it to pre-heat! Remove it from the oven and place it on a plate to cool. 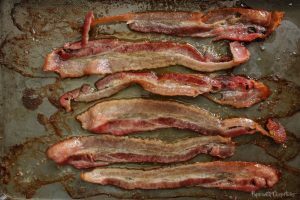 If you’re using parchment paper you won’t have the issue of the bacon sticking to the pan, but if you made the bacon directly on the pan or used foil and let it cool on it, it will stick to the pan, so we want to move it off before it’s glued on. 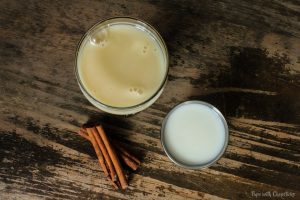 There’s nothing to this, open a can of condensed milk, add milk and cinnamon and mix away! Thick & Decadent? or a Thin Drizzle? For the syrup, you can decide how thick you want it, just add in the milk 1 teaspoon at a time and mix! No more than 2 tablespoons though! I found that if you put put more than 2 tablespoons for 1/2 a cup of condensed milk it gets too runny and watery. 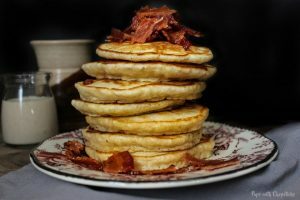 HOW TO GET FLUFFY PANCAKES? 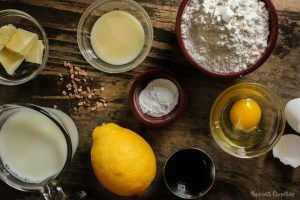 While making pancakes, I often would get dense cakey pancake and I often thought it was because I was not putting in enough baking soda but that was not the case! The secret to fluffy pancakes is to not over mix your batter. The OCD in me always wants smooth batter – but seriously don’t do it. A smooth batter will produce a chewy dry pancake, where as the lumps in the lumpy batter has air and chunks of flour bits which produces a nice fluffy (not dry) pancake. 🙂 In order to prevent myself from over mixing I tell myself I’m only allowed to fold\mix the batter 8-10 times max. HOW DO YOU KNOW WHEN TO FLIP A PANCAKE? 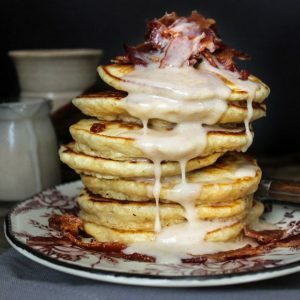 Fluffy, lemon pancakes topped with candied maple bacon with a cinnamon condensed milk drizzle! Dessert or breakfast? You decide! In a small bowl, mix the baking powder, salt and flour together until combined and then add it to the liquid mixture and lightly mix the batter. *IMPORTANT* In order to get fluffy pancakes, never over mix. 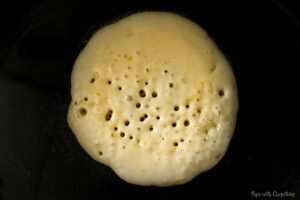 A smooth batter will produce a chewy dry pancake, where as the lumps in the lumpy batter has air and chunks of flour bits which produces a nice fluffy (not dry) pancake. 🙂 In order to prevent myself from over mixing I tell myself I’m only allowed to mix the batter 8-10 times max. Set the stove to medium low heat and add a tablespoon of oil and let it come to temperature and then add a dollop of butter to melt. Add in 1/4 cup of pancake batter into the pan. This batter is on the thicker side so when putting it in the frying pan, use the scoop to gently shape and spread it out to a less mountain like mound if you like thinner pancakes – and yes these do rise in the pan as well! Let it cook for about 2 minutes until bubbles form. Then flip it to cook for another 1-2 minutes on the other side. Repeat steps 4-5 for each pancake. If the pan is dry between cooking the pancake, add 1 tablespoon of oil and a bit of butter again. *IMPORTANT* In order to get fluffy pancakes, never over mix. A smooth batter will produce a chewy dry pancake, where as the lumps in the lumpy batter has air and chunks of flour bits which produces a nice fluffy (not dry) pancake. 🙂 In order to prevent myself from over mixing I tell myself I’m only allowed to foldmix the batter 8-10 times max. Whoah, what a great combo of flavors. Saving this one for a special breakfast or brunch! This genuinely sounds like my perfect breakfast! I think I know what I’ll be making this weekend! Holy cow is that a breakfast! Those fluffy pancakes look delicious. Love the don’t overmix tip! Great tip for so many baked items. For the longest time I could not figure out why my pancakes were hockey pucks haha! 🙂 Definitely a good rule for all baking! This sounds so good! 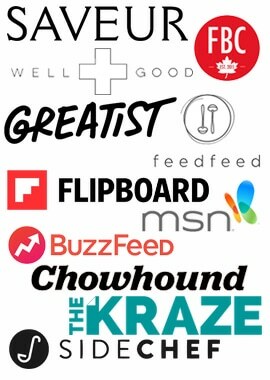 And I love that they’re not super sweet – minus the candied maple bacon of course. 🙂 YUM. Those pancakes look perfect!! Light and airy! I love the addition of the lemon! Dessert for breakfast! YAY! 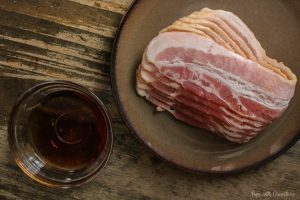 You had me at maple bacon. Your pictures are making me hungry for some fluffy lemony pancakes! Also, I didn’t know that you should put the bacon in the oven right away without having to preheat first! I’ll need to try that next time! 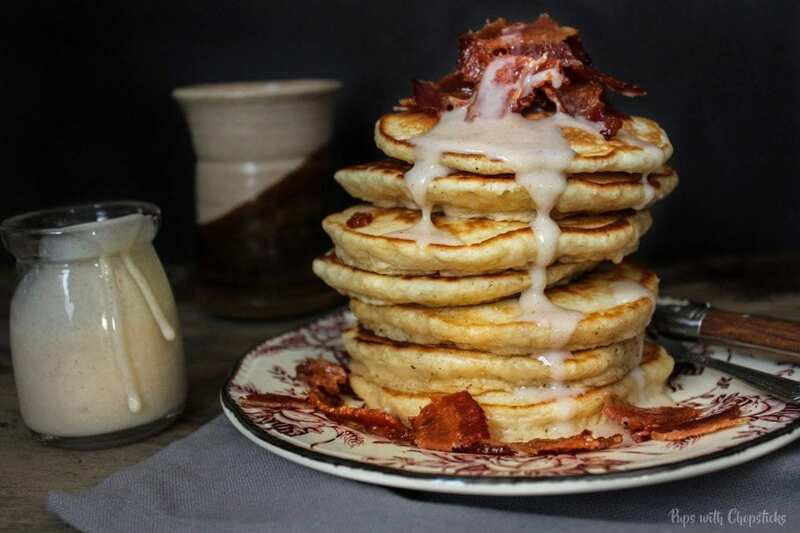 That’s a womderful dish, lemon pancake can mix with bacon. Tasty. haha that might be a fun thing to do to play a prank! however, ginger pancake with chocolate syrup doesn’t sound so bad either! Dang talk about a rich breakfast! Your photos look amazing and although I dont eat meat and I can imagine how delicious these are cause I used to eat bacon lol.